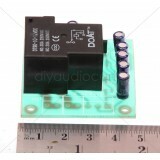 The speaker protection circuit has two main funtions, To protecct the audio amplifier and the loudspeaker during start-up sequence when the amplifier output might exhibit DC voltage. To protect the loudspeakers in the unlikely event of an amplifier power stage failure, where DC component would damage the speaker voic coil. Eight Audio - EASP03 - Two Channel Speaker protection Overview: The speaker protection circuit.. Octave 1 - Speaker Protection - DIY Kit Overview: This is a simple diy speaker protection kit ..